A two-level barn built against a bank or hillside, with an upper level that can be reached directly from the hill slope. A two-story barn usually built into the slope of a hill and oriented so that the ground floor is protected from the prevailing wind. An inclined driveway leads to a large sliding door on the upper floor, which contains an area set aside for threshing grain, storing grain, and storing animal feed. The level below provides housing for animals and is entered at ground level from an enclosed yard. 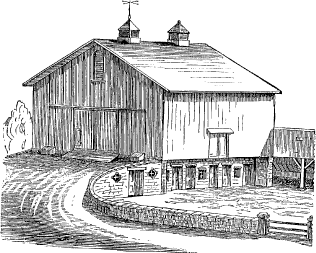 In the United States, sometimes called a German barn, Pennsylvania barn, or Pennsylvania Dutch barn. Also see barn, forebay barn, Swiss barn, Yankee barn.